The book contains everything you need to know about starting this adventure with your child. For each of the fifty careers, Alisa has included: descriptions of each career from someone in that specific field, multiple tasks at three different time/effort levels and the topics and skills that are learned within each career. You simply talk with your child and help him select a career. Together you agree upon the tasks that need to be completed, how much time he has to complete them and the amount of “pay” he will get upon completion. You can customize it to fit your family. You choose the difficulty level, number of tasks, amount of time needed and amount of money or other rewards. Every family is different and the Earn My Keep system is completely adaptable. It gets kids excited about learning, working and earning money. It takes abstract concepts and makes them relevant and meaningful to kids. Kids are learning the value of a dollar and are practicing different career skills in a hands-on manner. It is full of educational value. Each career is packed with topics and skills from categories such as math, history, language, science, money management, time management and more. 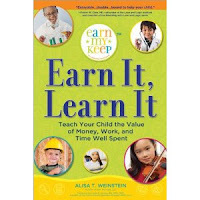 As a mom of four and a former school teacher, I think Earn It, Learn It is a resource that parents and teachers should have in their tool kit. It connects hard work and the value of money in a fun, engaging way. I have had several conversations with Alisa and her energetic, positive personality plus her passion for educating kids definitely comes through in her book. I plan on giving Earn It, Learn It a try with my two younger kids this summer and am anxious to see their response to it. For more information, please visit www.earnmykeep.com. Disclosure: I was given a copy of this book to read but received no compensation for the review. I love the idea. My mom did something similar, and it helped us become money-wise early on. I teach my kids about binary option as early as possible, too! Thanks for the tip, sounds like an awesome book for parents.